When anyone asks me for a Brighton restaurant tip, I always suggest the Chilli Pickle. Of all the recommendations I've made for places to eat in Brighton, people seem to get back to me and tell me what a great meal they've had here. Some have even Twittered me from the restaurant itself! Its taken me a while to go back, a couple of times I just couldn't get in as they were fully booked. This has become a really popular Brighton restaurant, offering authentic Indian food served with a keen eye for detail. They absolutely stunned me with my first meal there and I had very high hopes for my return. As it was Mr. Graphic Foodies birthday, I was going to treat him (read me) to a total blowout feast. But as he chewed on a few little Whitebaits, seasoned in spiced flour, his expression was quite serious. He didn't make the usual "mmmmm" sounds that he does when he is enjoying his food. He stopped eating and put both hands down on the table and looked straight ahead. I was worried that this was going to be the start of a duff meal. 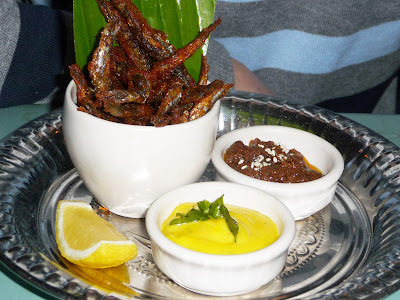 When I finally coaxed a response out of him he eventually said "This is the best whitebait I have eaten in my life". You see he is quite serious about these little fish and I'm sure he wanted to rifle through his entire collection of whitebait memories (yeah, he's a bit odd) before making the claim. Phew, now all that was left was the chilli to make me sweat. My starter of Kabali Chana Chickpea fritters with Green Chilli, Ginger, Coriander, Garam Masala and Beetroot, served with Saffron Riata were simple, soft and spicy A pleasant kick to get the stomach in action. Also worth mentioning are the Chilli Pickle's poppadoms that we munched on whilst browsing the menu. With a choice of fried or roasted (or both) these were much lighter and more delicate you would typically be served down your local Indian restaurant. Served with three of their delicious homemade pickles and chutneys in varying heats and well worth a try. 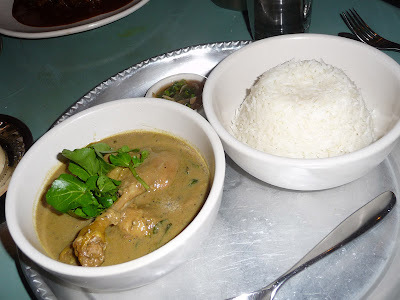 For mains, I chose the Chettinad Duck Legs in a warm spiced black pepper gravy with steamed rice and pickled onion salad £13.95. A bit pesky to eat, chasing the bones around the bowl but worth the reward of soft meat and the firey gravy. I really did enjoy this, the levels of flavour they manage to get into their food here beyond the heat is down to highly attentive cooking and the thing that sets them apart by a long shot from other Indian restaurants in the city. Mr. GF enjoyed the Chilli Pickle's signature dish of Oxtail Madras so much last time that he couldn't be swayed from choosing it again. The beef is local and gently braised in a spiced (4 chilli rating) gravy served with cumin pilau and spring onion riata. 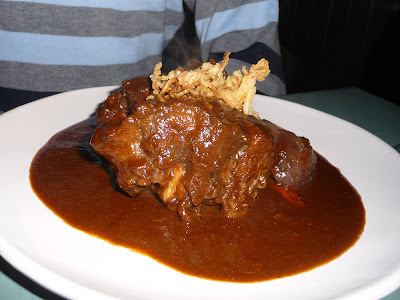 As before it was enjoyed, although the oxtail was meatier and more tender on our first visit but rich, intense and flavorsome none the less. Ordering desserts at this point would have been insane as we were fit to burst so a little break with some Peppermint Jing tea was in order. The staff, of which there seemed to be a lot more of on this visit, were knowledgable and explained each element of the dish in detail as they served it to you. And I like it when a waiter actually suggests a dish to you and you can tell it's not just because they are trying to shift it in the kitchen. I really liked the dessert of coconut soup with nuts and cocnut ice cream served with a little coconut pastry that was suggested to me as an alternative to the my usual Gulab Jamun dumplings. It was quite unusual but really interesting and worth a try. 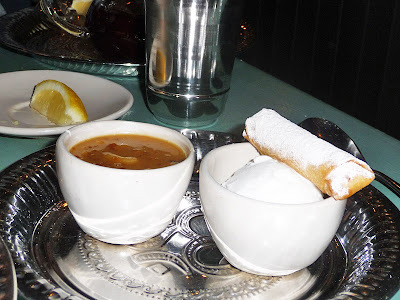 I loved the softened nuts in the coconut soup. I didn't get a chance to see if the dumplings soaked in syrup were as good as before as Mr. GF hoovered them up but it was a bit annoying tht the cardamon ice cream had been replaced with vanilla without mentioning. I only noticed as it was particualrly good before. Drinks were chosen from the extensive beer list, featuring some wonderful micro-breweries. We opted for an enomous bottle of Meantime India Pale Ale. Dinner came to £70 with all the bells and whistles but with starters at £4-7 and mains £9-15 this is exceptional value for the quality of food. I still have to try the daytime Indian street food menu which I have heared good things about, or even go for an afternoon tea with a twist. 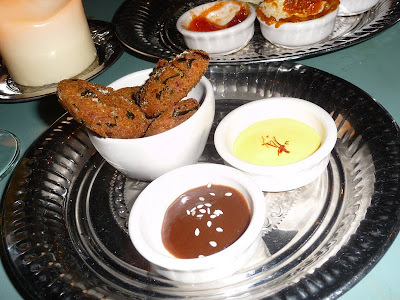 The Chilli Pickle is becoming one of the best restaurants in Brighton, if it isn't already.